An initiative, started in 2014 to empower deprived young girls of underperforming schools with STEM Education, i.e. Science, Technology, Engineering, Mathematics through hands on learning approach. The aim is to make learning an enjoyable process among the children and provide a stress free platform for sustainable growth. The children are allowed to make mistakes and encouraged to overcome it fruitfully. They are provided with necessary equipment to experiment and learn Science and Maths subjects. The team is taking all the essential steps in designing new methodologies to teach and motivate children to come up with different ideas and projects. We strive to provide quality education for underprivileged children free of cost. Besides the totally technical and subject related classes, children are made to practice green activities in the school. On seeing overwhelming response from the children, we decided to set up 'Eco-GREEN' Clubs in the government schools. 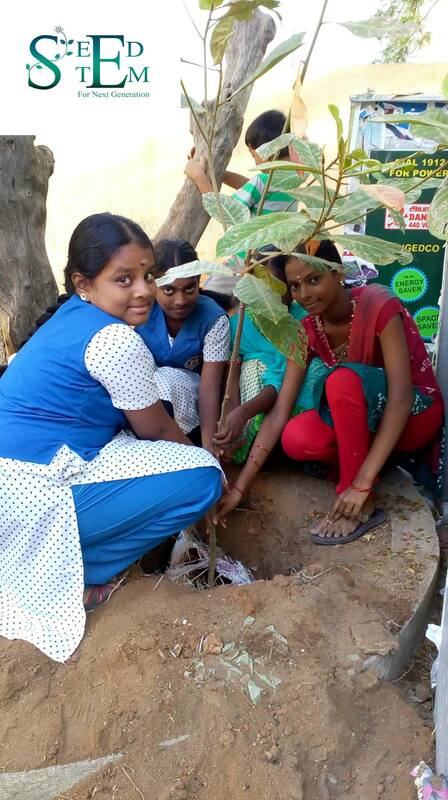 The activities involve organic farming, composting, tree plantations, talks on Plastics and reducing techniques, Menstrual hygiene Awareness, Paper recycling and cloth bags making workshops etc. Likewise, there will be classes on communication skills, confidence building and personality development. Motivation workshops will also be held and on every weekend there will be session on SELF DEFENCE for Girls and CHILD SEXUAL ABUSE Education. The project explores the gaps in the prevailing education system. More of hands on experience is needed. Further, other subjects that will ensure more all rounded growth are being taken up. Education is the master key to mental, emotional and academic growth of children. Providing it with hands on learning techniques enhances the knowledge of the children rapidly. We at SEEDSTEM strive to impact the lives of underprivileged children. Our primary target is to make them excel in all activities. We bring out the best in our children through our activities focussed on their all round development. Apart from the academic scores, the children perform well in all other activities. They enjoy experimenting and learning through our syllabus. The project also promotes the essential concept of sustainable living in the young minds. The children benefiting from our programs will surely inspire other children. They will make better citizens of our country. 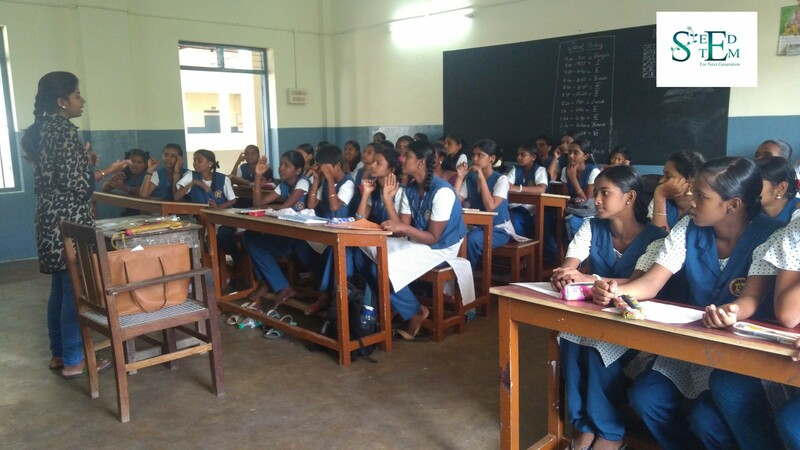 Chennai, a region in Tamilnadu, India has 500+ primary, middle and higher secondary schools. We are focussing to reach as many schools possible and scale up to entire state of Tamilnadu in the near future with funds/resources provided. Education for Sustainable Development is Education for the future. Children are our future and by making them aware of the current situation and equipping them with the knowledge and resources, we are making them environmentally responsible as well. Education is a vital key to empowerment of women and an instrument for bringing about positive attitudinal changes in women. I'm a 21 years old girl who is the Founder of this initiative. I have recently completed my Bachelors' degree in Mechatronics Engineering. I presented my work in International Conferences at Washington D.C., Japan and represented an organization to United Nations Meeting on Science and Technology for Development, from India. I have currently involved in projects on Power Generation through renewable energy resources. I believe in the power of youngsters in sustainable development and want to prepare my brothers and sisters be future ready, friendly to nature and safeguard it for better Earth. Thank you so much for your valuable comments and votes. It will surely help to run my initiative effectively. All the best! 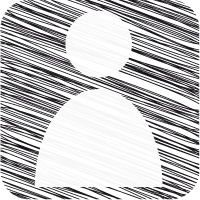 Let's be in touch. A wonderful project .. Helping students to learn in an interactive classroom helps them to learn with ease and fun ... What is your plan to develop your project in the future? It is usually really interesting to see a lady being creative. Your effort is really worthwhile. Helping girls will do much good to the society. I have gone through your idea and it's amazing. You and your team are doing an innovative work to educate students. To make students environment friendly trough education is best way. Dear Sir, I so much love your concept in promoting stem education for the female folks, our project is quite similar in educating the upcoming generations on electronics and programming. I have sent you an email so that our company can collaborate together. I support you project 100percent and kentrogenesis will love to learn more about STEM laboratory and it's requirements. Education is the backbone of a Nation and should not be accessible to all. An excellent project to empower women who are under-educated in schools. Through your project, they can get an education about science, technology, engineering and math through fun learning. Very inspiring. It's so heartwarming to see other female Indian entrepreneurs on this portal. Being an Indian myself, I completely sympathise with the root problem you are trying to address. Harmful prejudices and taboos impair the ability of an Indian woman to fully realise her fundamental freedoms, and I'm so happy to learn that you've decided to address this problem by aiming to foster agency. I would love to connect with you to know more about your experiences, as I'm following a similar approach in promoting safer reproductive health amongst Indian women. Your efforts to teach science subjects in simple manner to female children is highly appreciated followed by the nature friendly activities. Educating a woman results in educating generations. Good work! We need more initiatives like this. All the Teachers an Professors on the Globe must t take a personal action on the topic of teaching sciences. As President of the Commission of Education and Development of the Astronomy of the International Astronomical Union, I support deeply this project. The idea of introducing green activities in school is really impressive and need of the hour, these things should be taught to children in their school level itself, you're on the right track. All the very best. Heyy Hiii,,,Finally u r thr!!! Am really proud of u yjay,,, STEM education has been playing a major role for the future Generations,,,it became necessary to concentrate our efforts among school going children who generally acquire the traditions and rituals followed blindly by their parents. 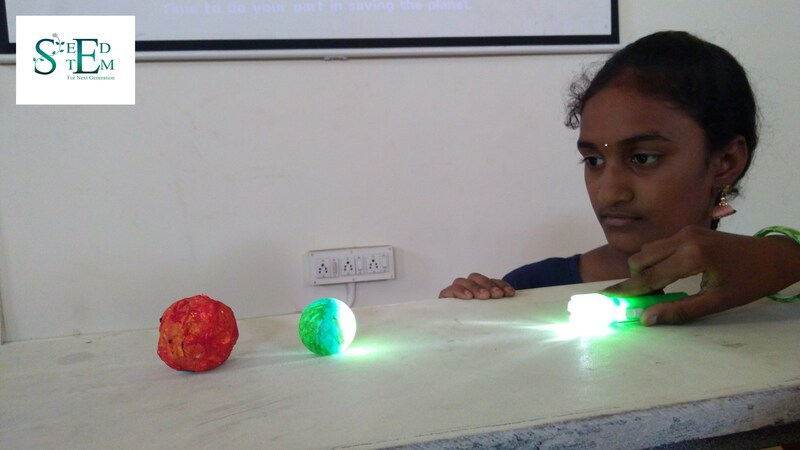 If it is possible to inculcate scientific awareness at that tender age by some means,, the young will be aware of the importance of scientific attitude throughout their life,, I think Yjay u have done a Great Job on Innovating this Project..,,Hats off!! Wishing u Great success!! It is a very good idea that science, technology and engineering teach children how to think and analyze so a generation of intelligent children can be created.